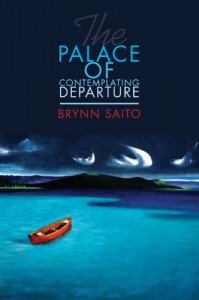 Brynn Saito is the author of The Palace of Contemplating Departure, winner of the Benjamin Saltman Award from Red Hen Press (2013). She co-authored, with Traci Brimhall, Bright Power, Dark Peace. Brynn was born and raised in the Central Valley of California to a Korean American mother and a Japanese American father. Brynn is the recipient of a Kundiman Asian American Poetry Fellowship, the Poets 11 award from the San Francisco Public Library, and the Key West Literary Seminar’s Scotti Merrill Memorial Award. Her poetry has been anthologized by Helen Vendler and Ishmael Reed, and has appeared in Drunken Boat, Muzzle, Verse Daily, Virginia Quarterly Review and Waccamaw. “Writing” without writing anything down is liberating, so sometimes I write poems in my mind while wandering a city street or while riding a train, listening to music. Other times, I’m good about waking and first thing making my way to the desk to record my dreams and see what follows. Mostly, I try to do a little writing everyday—journaling, free-writing—to “keep the portal open,” as the writer Julia Whitty once advised writers to do. In the end, a lot of my process is tied to community: I get the writing done when there’s a friend, or writing group, or editor holding me to some sort of deadline. Deadlines, I’ve heard it said, are a writer’s greatest inspiration. I love what Annie Dillard said in her book The Writing Life: “Write as if you were dying. At the same time, assume you write for an audience consisting solely of terminal patients. That is, after all, the case. What would you begin writing if you knew you would die soon? What could you say to a dying person that would not enrage by its triviality?” I probably haven’t succeeded at avoiding the trivial, but Dillard’s questions help me to get at the urgency of what I’m trying to communicate in a piece of prose or poetry. 3. Can you say a little bit about the genesis of The Palace of Contemplating Departure? The book is a compilation of about eight years worth of writing and revising poetry. I was doing a lot of departing, arriving, coming, and going during that period of my life and the poems in the book write into—and out of—that tension and momentum. I didn’t understand that “departure” was one of the main threads woven throughout the book until my editor, Kate Gale at Red Hen Press, suggested calling it “The Palace of Contemplating Departure” (which is the title of one of the poems in the collection). Suddenly the book revealed itself to me, anew. The best writing converts wonder to more wonder. Live the questions, said Rilke. I believe writing begins in inquiry, in deeply questioning the things of this world. In marveling at them, in rebelling against them—with words, emotions, and ideas. Every poem or piece of prose is, for me, rooted in a question that is alive for me at that given moment. It seeks resolution, but resolution is never possible, so the world remains wondrous and the writing, inexhaustible. My poems teach me things I would not know otherwise. They know more than I do: they reveal to me my hidden desires and obsessions, they show me who I am. This was written by joannemerriam. Posted on Wednesday, April 24, 2013, at 2:20 pm. Filed under Poetry, Um... yeah. Tagged Brynn Saito, Intermittent Visitors. Bookmark the permalink. Follow comments here with the RSS feed. Both comments and trackbacks are currently closed.